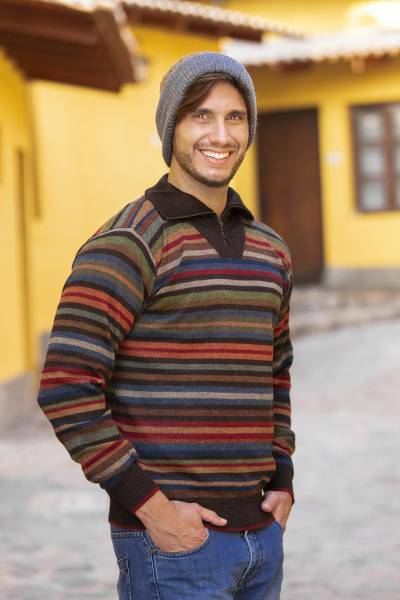 Men's 100% Alpaca Striped Pullover Sweater with Turtleneck, "Brown Heights"
Ana Fernandez designs this handsome pullover sweater for men with warm brown undertones. The sweater is knitted of genuine alpaca, a long time favorite in the Andes for its soft and lightweight warmth. Featuring horizontal stripes in light blue, green, orange and red, the sweater closes with a zipper on the turtleneck. You can find men's 100% alpaca pullover sweater 'Brown Heights' by Ana Fernandez in clothing categories such as Alpaca Sweaters, Alpaca Wool Sweaters and Pullovers Sweaters. Enjoy exploring these sections for other Novica treasures.